NYC Girls Weekend - Shopping, Food, and Broadway ~ Learn, Live, and Explore! Have I mentioned before how much I love Washington D.C.'s proximity to New York City? And you have so many alternatives for convenient modes of transport - car, bus, train, and plane. My preferences are to either drive up myself or to choose from one of several bus operators that provide cheap round trip fares. Amtrak is great, but can cost as much as a flight. And, while it may be the shortest trip, flying costs more, requires a cab ride into and out of the city, and has the most risk of being off schedule, I think. This weekend, we opted for the bus. I like Vamoose because it leaves from Bethesda where the parking garage is free over the weekend. Several other buses leave from different starting points around the D.C. Metro region as well - BOLT bus, Mega Bus, etc. The bus option for this weekend dose of NYC was perfect for me since I, currently, have my nose buried so deep in a book series right now that I can't see straight, let alone drive 4 hours!! Once we arrived in Manhattan and got our stuff stashed at a friend's apartment, it was time to take advantage of the weather to walk to SoHo for some shopping! 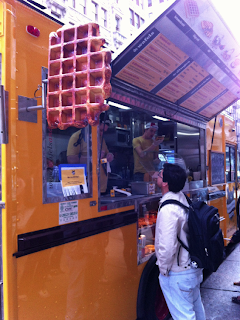 It was also lunchtime, so we made a snacking tour of the area as well, stopping first to taste the deliciousness served by the Wafels and Dinges food truck parked on Broadway. 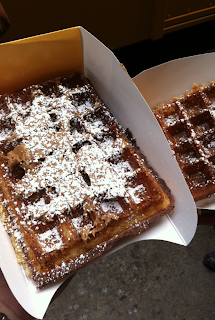 I got a plain Brussels Wafel with speculoos spread as my dinge (or topping...well, it actually means thing or whatchamacallit in Flemish). I've never had speculoos before, but after it was described as a gingerbread/graham cracker spread, I said "yes, please!" Come to find out, it's the same taste as the Biscoff cookies handed out as snacks on airplanes. My friend, not one to pass up anything that is paired with bacon, went for the maple bacon wafel for her snack! While the Tribecca Taco Truck parked next door looked tempting, after eating such a sweet treat, we had to pass on that snack stop. 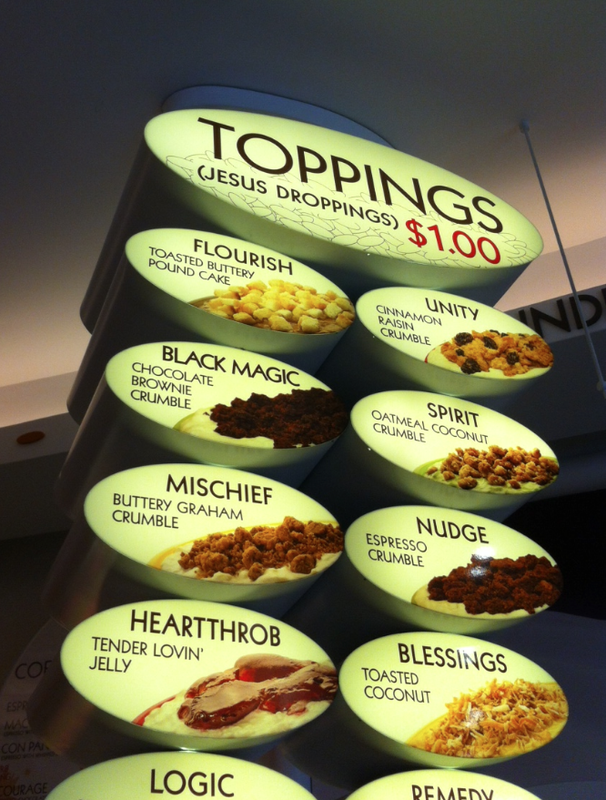 After a little shopping to burn off the waffles, we ended up sharing a tasty treat at Rice to Riches. This place ONLY serves rice pudding. 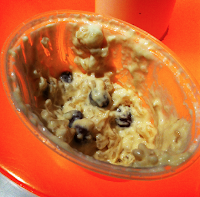 But not your everyday rice pudding, rather at least twenty different great flavors. We opted for one of the most popular, the Cinnamon Sling, that tastes like you're shoveling oatmeal raisin cookie batter into your mouth. This time, we didn't add any dinges....or as they call them at Rice to Riches - Jesus Droppings! Love it! 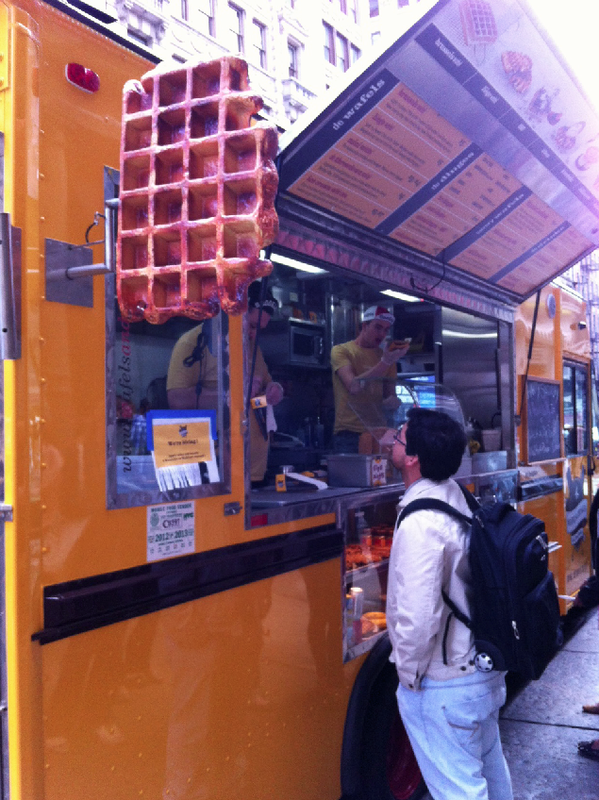 Because we were in NYC, we had to continue on this yummy culinary tour for dinner. For our pre-theater meal, we crossed over to the West Village to sample the Italian fare at Corsino Cantina. They have delicious crostinis to try as starters -- we selected the sweet onion & walnut, canellini/mushroom/lemon thyme, and the brussel sprouts & pecorino. For antipasti, we shared a huge bowl of baby arugula, apples, walnuts, and red onions and an amazing risotto croquette. Cheese and rice? Yes! Our pasta was also fantastic. I got the trofie with basil pesto, potato, arugula, and ricotta salata. Paired with a very light pinot grigio, it was the perfect trip through the tastes of Italy - and great preparation for my upcoming journey to the "boot country." We were able to squeeze in a stop at a local gelateria, L'Arte del Gelato, to cleanse the palette - and to also help prepare for my trip, of course. We were so absorbed in our gelato experience, that we didn't realize the cab driver was taking us up 6th Ave. to get to Times Square to our theater. If you know anything about traffic in NYC, that is NOT the best route and traffic costs more. 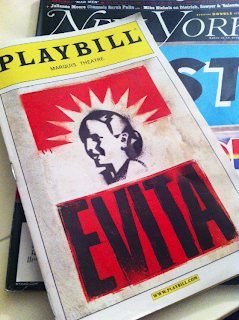 We found ourselves ditching the cab two blocks away and walking very fast to the theater on 45th St. For this NYC adventure, the show of choice was the revival of Andrew Lloyd Weber's Evita on Broadway, starring Ricky Martin. Overall, it was your classic Broadway show. I was impressed with Ricky Martin and a little underwhelmed by the woman who played Evita, especially considering that she had played the role on the West End. Since we were still pretty energized after the show, we searched for a fun place to grab a drink after down in the Union Square neighborhood. Due to the fact that it was 10:30pm on a Saturday night, seating space was limited. So, we found ourselves some stools at the bar of Pure Food and Wine, a restaurant that serves raw vegan food - not surprising to find empty seats there, in my opinion. This was probably my one and only vegan/raw restaurant experience. After passing on the Master Cleanse Tini (a martini using the ingredients from the master cleanse recipe....no thanks!!! ), I ordered a rosé sangria. Since the food did not use any eggs or dairy, I didn't even consider ordering dessert because there is no way it could taste good! My friends were braver than I and went for the dark chocolate semi freddo with passion fruit puree and the "creme" brûlée with a mango slice for a crust. I, on the other hand, went for an assortment of nut cheeses...primarily because I liked saying the name "nut cheese." I didn't have high hopes since they were stripping the "cheese" of the best part - the CHEESE! Instead, they somehow molded nut paste and herbs into balls in order to cut into wedges, and served it with rosemary crackers. My review of Pure Food and Wine: well, at least the company was great! 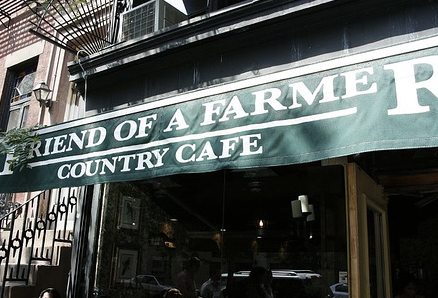 Once we finally woke up the next morning, we got dressed and dragged our butts over to one of my favorite breakfast spots in NYC: Friend of a Farmer in Gramercy Park. 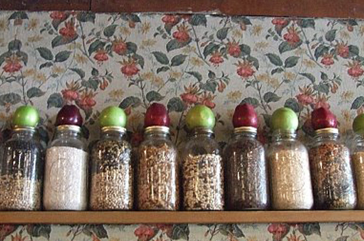 Not only is this place supercute with its rustic turn of the century decor, floral wallpaper, and baskets of fruits and vegetables, but it serves delicious, hearty food. I couldn't decide what I wanted, so I opted for the sampler plate: the Boomer Special with the eggs, home fries, bacon, and thick cinnamon raisin bread french toast. I also ordered a kids plate of the pumpkin pancakes to share with the table. Bonus, it came with a ton of sliced fruit. If you're planning on going to Friend of a Farmer, try to get there before 10am. They do not take reservations and space is limited, so you may find yourself waiting, especially if you have a party greater than two people. To round out the quick NYC trip before we had to catch the bus home, we wasted some time wandering the miles of books at the original Strand Bookstore on Broadway. While not as big as my beloved Powell's Books in Portland, it's still overwhelming with its volumes of books. You really need to come there with a purpose or a subject you're looking to learn more about. Their American History section took up a huge part of just one floor!